Liam and Matty Welham could become the latest brothers to play for the Dons in Sunday’s iPro League One Cup tie against North Wales Crusaders at the Keepmoat Stadium (3pm). Older brother Liam is certain to start and close season signing Matty is also in the frame to start on the opposite flank. It was Liam, last season’s player of the year, who alerted the club to his potential. “When I recommended him to the club it was pure business and nothing to do with the fact that he was my brother,” he said. “I just thought he’d add something to the squad. “I coached an amateur team in Hull and Matty used to play for them so I know how he plays and what he can do. He’s an out-and-out full back but he’ll play anywhere in the backs and at the moment it looks as though he’s likely to be playing on the wing. 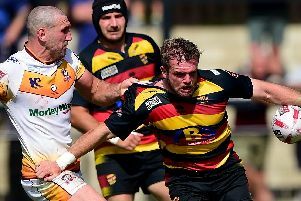 The older Welham is one of only a couple of players expected to be involved who was in the Doncaster side put to the sword by the Crusaders in last season’s Challenge Cup. “We are certainly looking to avenge that defeat but we are expecting a tough game,” he said.